Native America leaders continue to call for divestment from fossil fuel industries, pipelines, fracking, etc. and the banks that fund them. In March 2017, we started a divestment team. 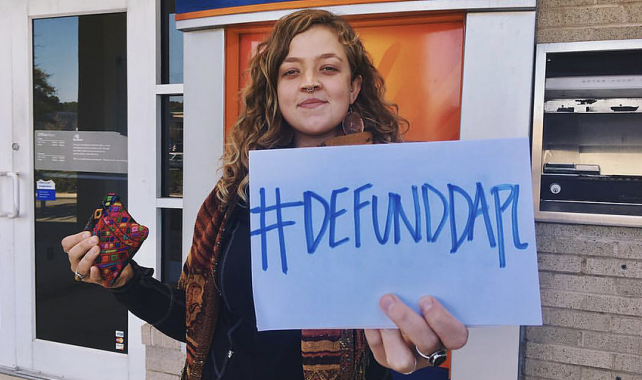 We focus on personal and institutional divestment from the Dakota Access Pipeline (DAPL) and other fossil fuel investments to break the stranglehold the fossil fuel industry has on our democracy and our environment. We work closely with the Public Bank Santa Rosa (PBSR) work group on supporting a public bank of Santa Rosa to enable the City of Santa Rosa and other local institutions to divest. Endorse the resolution for a Public Bank of Santa Rosa! We worked closely with PBSR to write this resolution. It is essential to our institutional divestment work. Read more about the tremendous local benefits of a public bank on our site, and on PBSR's web site. Ask local businesses and organizations to endorse as well. We started with a focus on individual divestment. This could be expanded to include socially responsible investment. We’ve been tabling since the beginning with information focused on convincing people to divest, and most individuals don’t have the kinds of large holdings that institutions such as cities, counties, pension funds, churches and other such organizations do. Educate individual people about how divestment supports the Standing Rock tribes and Native American sovereignty, water and land rights. Present to institutions such as city and county government, CalSTRS, CalPERS and others, criteria for investment that is socially and environmentally responsible. Click here for information about the link between divestment and public banking.